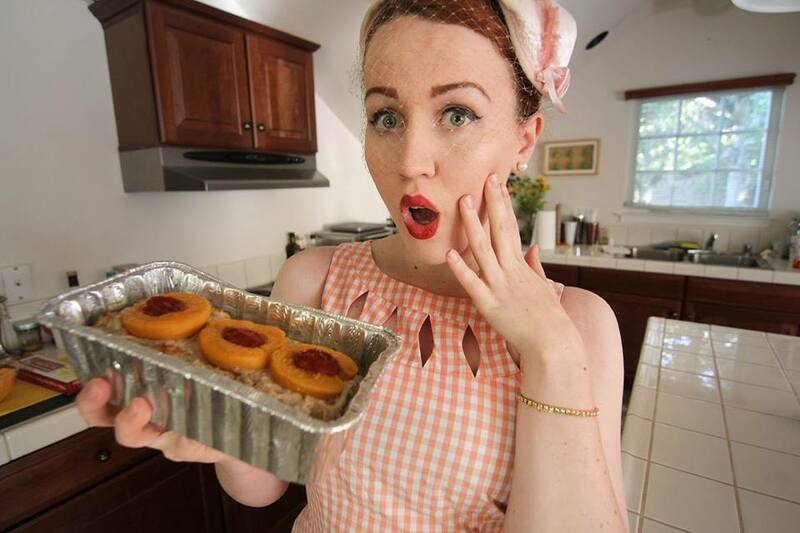 What do you think would go in a spicy peach loaf? My guesses were peaches, Tabasco, hot peppers, ground meat. Guesses I received on Instagram (which were some really good guesses!) from @the_anti_bug were; allspice, vinegar, or spicy jelly. & @tallary said “tuna”, good guess Hillary! But alas, none of these good guess were found in this loaf. Start heating oven to 305*F. With fork, beat egg well; add chuck, sausage, milk, salt, thyme, crumbs, onion; combine lightly but thoroughly. Place in 8″ x 8″ x 2″ pan. 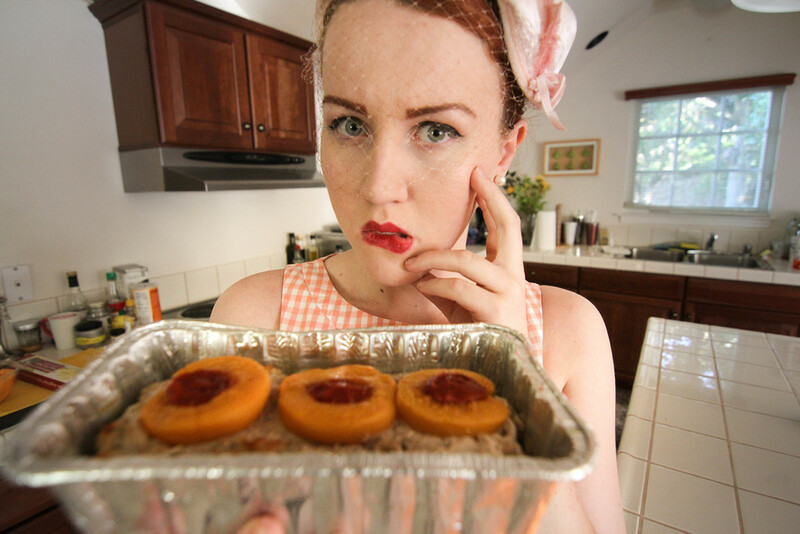 Press peaches, with hollow sides up, into meat; place 1 teasp. catchup in each hollow. Bake 30 min. Pour off excess fat; bake 20 min. Cut meat, around each peach, into square. Makes 6 servings. So maybe you can tell (& if you watched my YouTube video)…you’ll know that I used lean pork & turkey instead of ground chuck. That’s why it’s so ghostly white….. Directions are the same… just before adding the crumbs mix the milk & dried bread crumbs together to moisten them! I still have lots of questions when it comes to this recipe? Like “What makes this recipe spicy?” or “Do the peaches help in keeping the meat loaf moist?” & “Why peaches & meatloaf together at all?”. After all the questions though, I must admit when I say this recipe isn’t half bad. I know. I know. I like the sweetness that off sets the savory elements. 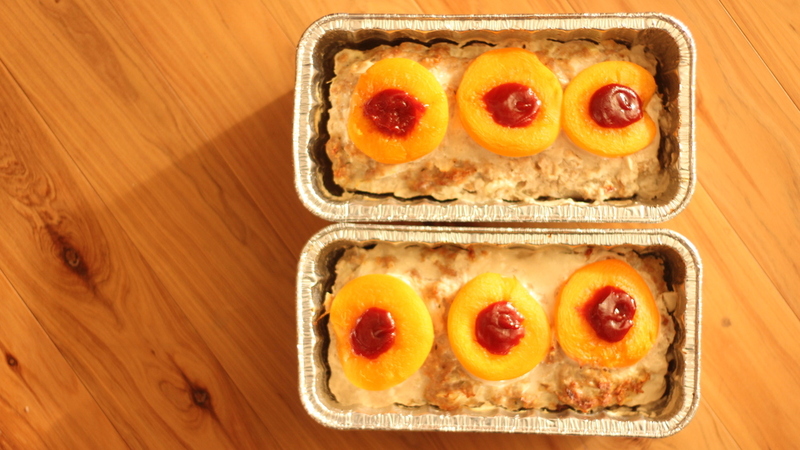 I like that if you serve them each with a peach half as you cut into it, with almost every bite you get a layer of meatloaf, a piece of the peach & a dollop of catchup. I don’t understand it, but I like it. Don’t forget to subscribe to my blog & YouTube channel & leave some comments letting me know what you think! 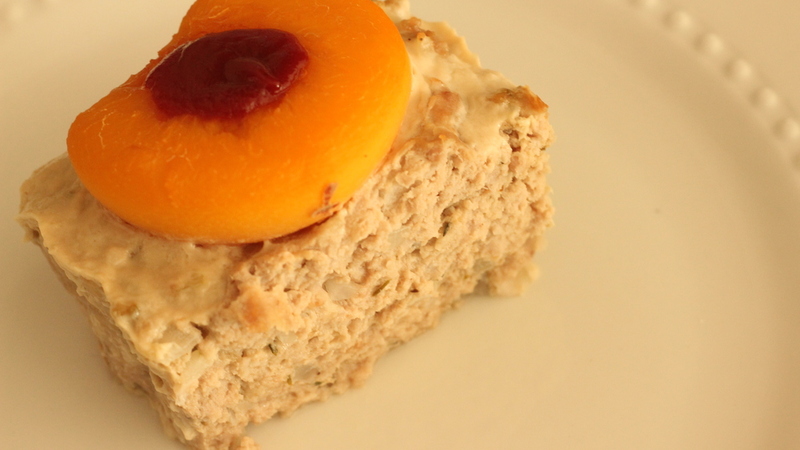 What do you think goes in a Spicy Peach Loaf? This sounds soooo weird. You look really pretty in these photos.